Senior forward Kourtney Kekec was born and raised in St. Louis, Missouri before receiving her offer at UTSA to pursue her dream of playing college basketball. 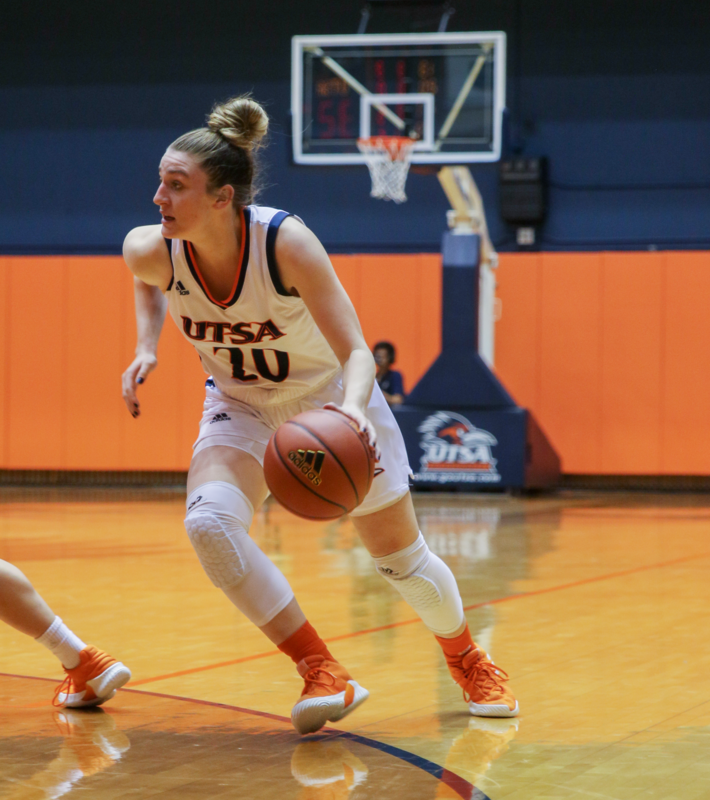 Prior to UTSA’s offer, Kekec had never heard of the Roadrunners, but after visiting the campus she fell in love with the atmosphere, the Mexican food and UTSA’s “at home” feel. This holiday season, Kekec’s family will fly down to cook for her and her roommates, which is something they have done for the last three years. For their Thanksgiving dinner, her family prepares green-bean casserole, sweet potato casserole, mash potatoes, mac and cheese and the turkey at home, then pack up the food into coolers and fly it all down to UTSA. In Kekec’s free time she enjoys playing the piano and watching sports games. When she was younger, she played almost every sport she could because of her father’s coaching influence. When Kekec was young, she went to almost every game her father coached. He was the football and basketball coach for her school, North County High School, up until she started attending. Her father then became an administrator, and her mom was the volleyball coach of the high school. Kekec is majoring in public health with the hopes to further her education in medical school, and become either a dermatologist or an orthopedic doctor. Her inspiration for the medical field was from her grandmother. She is a nurse and seeing her work hard in the medical field pushed Kekec towards medicine. Kekec finds herself happiest when she’s somewhere surrounded by sports, whether she is playing the game or sitting sidelines. She was instilled with sporting environments since she was young, and she could not imagine herself anywhere away from a game. Back home in St. Louis, Kekec’s favorite go-to restaurant is Imo’s pizza, and here in San Antonio, she has fallen in love with Data Point Tacos. The biggest plus on her pros list for San Antonio is all of the Mexican food. Kekec is an extrovert. She finds herself loving to meet new people and going out of the house because she doesn’t enjoy sitting around as much. When she is with her close friends back home, she enjoys watching a movie and catching up. Although she is a very outgoing person, lately she finds herself at home resting and watching movies with friends, but she was the type to enjoy constant going out and meeting new people. Growing up, Kekec’s father would tell her ‘you can’t control anything but your effort and your attitude.’ This motto stuck with her through almost everything she encountered in her life, but especially with basketball because she would find herself frustrated after games. Her father would remind her that she could only control her effort, her attitude and the way she would respond to things.